I’ve received clarification from Urban Decay’s PR representative in the UK. Debenhams.com will be restocking the Alice in Wonderland on their website. They’re hoping to have this done within the next 2 days, but can’t give an exact time frame. Advice is to simply keep checking. The palette will then hit Oxford Street Debenhams on the 28th of February. On the 1st March, the palette will roll out to Debenhams stores nationwide. Check to see if your local has a UD counter because if you pop down to your local counter, you’ll also have a (no purchase necessary) chance to win a pair of tickets to see Alice in Wonderland at the cinema. Please refer to this post for further shopping details. Bloody hell I am glad I (for once) am not interested in purchasing this limited edition thing, as it seems like trying to get one is a right old palaver! No that I don’t think the colours are pretty, I do but I just know that being made of cardboard I will damage it just like I used to do with all of my Stila cardboard ones! They were such a state after a few uses – I must be rough! If anyone is in the North East area, I managed to get a palette yesterday at the new Debenhams in Eldon Square. They seemed to have quite a few of them! I’m tempted just to get one to sell it on eBay. Have you seen what some of them are going for?! Nearly £60!!! Louise – same here! I got mine yesterday at the Eldon Square branch. I reserved my palette, but I saw they had around 4 on display when I picked mine up. They may have had more in drawers/storage but I’m not 100%. Ooh, I’ll keep checking online then (has anyone noticed they’ve actually removed it from the website completely? there used to be a link on the main page and it’s gone), and if all else fails, I’ll go to Oxford Street on Sunday. 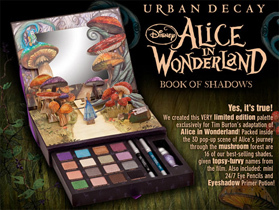 Alice in wonderland urban decay palette in #debenhams in birmingham bullring from 11am. I just asked and UD lady told me exact times they plan to sell it. She did however lie to me and say how the palette contained 5 new colours! I have my palette at home now! It’s now available again on debenhams.com, hurry, get your copies!! !